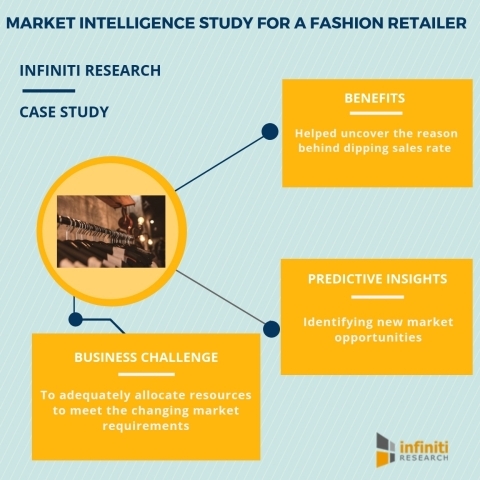 A well-known market intelligence company, Infiniti Research, has recently announced the completion of their latest market intelligence study for a fashion retailer. The study highlights how the client was able to adequately allocate resources to meet the changing market requirements. Also, the study explains how Infiniti's market intelligence solution helped the client to curtail the losses incurred and enhance their profit margins by 22%. Growing consumerism, inventory management, sustainability, millennial buying behavior, and entry of new players have increased challenges for fashion retailers. This has pressurized companies in the fashion retail industry to leverage a market intelligence study to drive change and flourish in the fast-changing industry. Our solutions help businesses keep tabs on target market segments and track emerging market trends. Request a FREE brochure to know more about our solutions portfolio. The business challenge: The client is a well-known European fashion retail industry player. The company was facing a decline in their overall sales rate along with a dip in the frequency of shoppers. Hence, they decided to conduct a market intelligence study to understand the dynamism in the European fashion retail industry. With Infiniti's market intelligence solution, the client wanted to gauge customer behavior and keep track of market changes. Make smarter business decisions with Infiniti's market intelligence solutions. Request a free proposal to know how our market intelligence solution can help. The solution offered: With the aid of Infiniti's market intelligence solution, the client was able to gain in-depth insights into the European retail industry. The market intelligence study helped the client uncover the reason behind their dipping sales rate. The solutions also empowered the client to adequately allocate resources to meet the changing market requirements. In a span of 4 months, the client was able to curtail the losses incurred and enhance their profit margins by 22%. Wondering how your business can benefit from Infiniti's market intelligence solution? Request more information from our experts! Interested in achieving high growth for your business? Get in touch with us to know how our market intelligence solution can help.